I can never remember, when you're counting something down, do you include today and the day of the event? If today is Monday and the event is Saturday then does that make it five days or six? 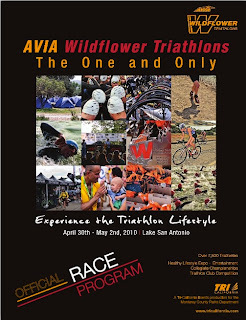 I could make cogent arguments either way but the underlying reality is that come Saturday morning at 9:45 or so, I will be on or near the starting line for the Avia Wildflower Mountain Bike Triathlon. Which means this is the last week to get some reasonably decent workouts in, add a little extra cardio to the tank, work on transitions and get our gear sorted out and then packed into the truck. We will be camping out at the triathlon along with 20,000 other triathletes and their support teams/families which will also be a new experience as the boys have not really done any camping save for sleeping in the tent in the backyard. I don't feel completely ready for the race especially since my training has taken a hit in the last week since the Sea Otter Classic where I bonked very hard. My legs have felt quite leaden lately but I'm doing my best to spin the deadness out of them. I've been putting in the time when I can and will race as best I can. I'm going to be approaching the race differently than the mountain bike race last week. I will be pacing myself better, holding energy in reserve, prepping better the day before and starting the race with a clearer race plan. And my main focus of the entire thing is to have fun, spend some quality time with my family and to not take everything so seriously. I know I'm not going to win so I'm going to try and have a good time. I still need to put together my checklist of gear, camping and other stuff. This is going to be a busy and fast week and I'm sure there will be much stress in the process too. Hopefully it will all end up in an awesome time for all of us. And maybe I'll get some cool photos as well. But really, I just want it to be a fun weekend.